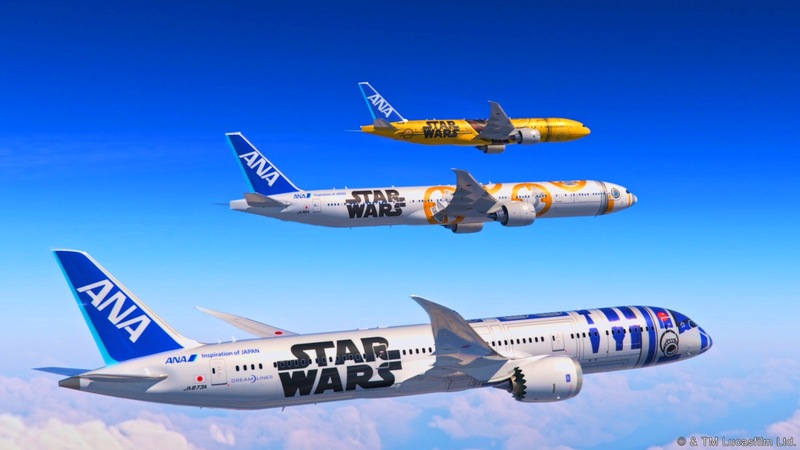 Japan’s All Nippon Airways (ANA) is adding another Star Wars-themed aircraft to its fleet of planes that feature Star Wars characters as their livery. ANA introduced the C-3PO™ ANA jet, a Boeing (NYSE:BA) 777-200, at the Star Wars Celebration Europe event in London July 15. The plane will start flying domestic routes in Japan toward the end of March 2017. The planes are part of the STAR WARS™ Project, a five-year agreement with The Walt Disney Company (Japan) Ltd., launched in April 2015, making ANA “[T]he first and only airline in the world to fly the special livery aircraft featuring Star Wars characters on the exterior of the actual aircraft,” the airline said in a statement announcing the C-3PO jet. The carrier unveiled its first aircraft, the R2-D2 Dreamliner, at the Boeing company plant in Everett, Wash., on Sept. 12. The second jet in the series was the ANA Star Wars Jet. Sporting a livery depicting both R2-D2 and BB-8, the Boeing 767-300 entered service on Nov. 22, 2015 on domestic routes within Japan. Most recently, ANA rolled out the BB-8 jet, a Boeing 777-300ER, on Mar. 27, 2016. While the C-3PO jet is the fourth plane that will sport a Star Wars livery, the ANA Star Wars jet will be repainted with the standard ANA livery before the C3-PO jet is delivered, maintaining the current Star Wars fleet size at three aircraft. The airline says the Star Wars liveries are in line with its strategy to further enhance its international presence. “The partnership with Star Wars, beloved by audiences in Japan and around the globe, is a perfect match as Japan’s largest airline seeks to connect travelers around the world through this project,” the carrier said.